STUDIO 4°C is a leading Japanese animation studio that continually creates animation titles that acquires a high international reputation. Eiko Tanaka, the president and the chief producer of STUDIO 4°C, established the studio after supporting the production of My Neighbor Totoro (1988) and Kiki’s Delivery Service (1989), both directed by Hayao Miyazaki, as the line producer. Since then, she’s been leading the studio on-site in the front lines, producing many masterpieces such as Mind Game (2004) and Tekkonkinkreet (2006). Their latest film, Mutafukaz (2017), is nominated for the Annie Award 2019 and Children of the Sea (2019) is currently awaiting its global theatrical release. Ms. Tanaka remarks, “STUDIO 4°C is not an animation studio, but a team of creators”. And there are many projects, including some brilliant anthology film projects, such as MEMORIES, Genius Party and Genius Party Beyond, which had set the stage for young talented creators. It cannot be overstated how much STUDIO 4°C has contributed and what she has done for the Japanese animation industry by finding and training new creators. It is also the excellence of STUDIO 4°C, under Ms. Tanaka’s guidance, that has marked young talents for the role of director in some featured films by pushing themselves forward by their insatiable passion for making great works, and they haven’t been afraid of business risks and difficulties due to these challenges. Lu Over the Wall and In This Corner of the World, directed by Masaaki Yuasa and Sunao Katabuchi respectively, gathered international interest after winning awards at the Annecy International Animated Film Festival 2017 and have been winning more awards globally. Ms. Tanaka is the person who noted the two talented artists early on, and gave them the initial opportunity to direct a featured film, so they could jumpstart their career as a film director, which resulted in the birth of two great films: Mr. Yuasa’s Mind Game and Mr. Katabuchi’s Princess Arete (2001). 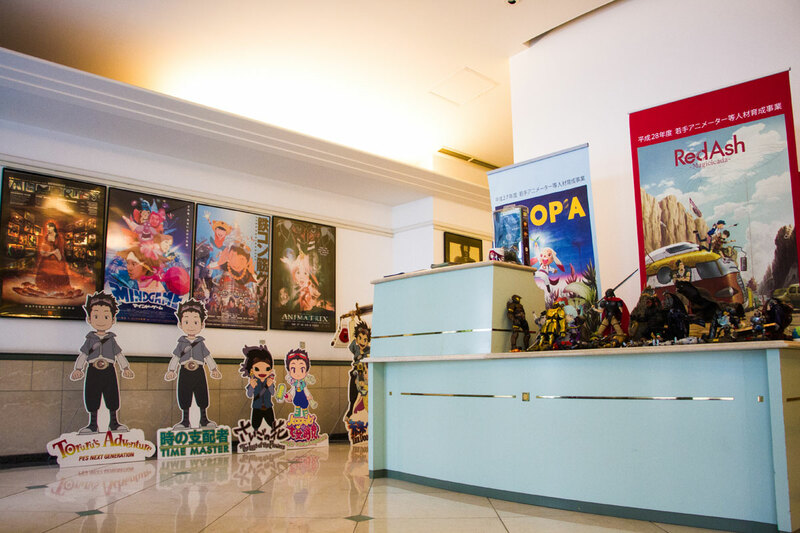 Business offers from around the world have been coming to STUDIO 4°C, producing masterpieces one after another, and some of them paid off as high quality international co-production projects, such as The Animatrix (2003). Hence, it could be said that Ms. Tanaka is performing a crucial role in bringing together talented Japanese creators that represent the Japanese animation industry, and the global animation industry. Animationweek had a special opportunity to meet Ms. Tanaka at the office of STUDIO 4°C in Tokyo, Japan, and hear valuable things such as the story of the production of each of their animated features, and her passion for each title and the talented artists she has worked with. We really appreciate them for this opportunity to share her precious words, giving us insights on why she is a great animation producer. Hideki Nagaishi: Could you please let us know your story on how you started your career in the Japanese animation industry and your journey in establishing STUDIO 4°C? Eiko Tanaka: I started work for an advertisement agency soon after I graduated university, and then my boss and I at the agency moved together to NIPPON ANIMATION Co., Ltd. It was the springboard for me to work for animation. I began my journey in the animation industry as an assistant producer, and the first title I worked for is The New Adventures of Maya the Honey Bee (1982), a TV series co-produced with Apollo Film, a European company based in Germany. Soon after I started to work as a producer, I noticed that the tasks of an animation producer, who is responsible for the entirety of an animation project, including budgeting and scheduling, can’t be handled without good management of the production process, such as keeping track of its progress on-site, and I strongly felt that I should understand much more about the field of animation production. Therefore, I worked as a producer and production assistant at the same time to learn animation production comprehensively after I asked the company to do the role by myself. I was eventually promoted to a production manager, so I’m a practical animation producer who has been trained from the start. Eiko Tanaka: I took part in many TV animated series projects such as Alice in Wonderland (1983), Manga Aesop’s Fable (1983) and Around the World with Willy Fog (1987), whilst working for NIPPON ANIMATION. After that, I joined a Studio Ghibli featured film project. When Studio Ghibli started developing Isao Takahata’s Grave of the Fireflies (1988), they also had a roughly 15-minute short film project titled My Neighbor Totoro directed by Hayao Miyazaki. Generally, the structure of Studio Ghibli is set up to focus only on one film at a time, and they build a new team for each new film, which dissolves when the film completes. So, Studio Ghibli at the time built Mr. Takahata’s team to develop Grave of the Fireflies. However, the story of Mr. Miyazaki’s short film project was expanding, and they thought that it will become a feature film, not a short film, so they needed to build one more development team for that. Then, they called me for my help. There are two types of producers in a film project at Studio Ghibli: One is a producer who plans a project and prepares the budget. The other type of producer builds a production team by gathering all the people needed to develop the film and controls the whole development process, from allocating all staff to managing the whole production budget and schedule in order to complete and deliver the film. I was the latter type of producer in the film project My Neighbor Totoro (1988). It is similar to a line producer in the West. It was around the time that Mr. Miyazaki’s new animation title was decided to become a feature film and the amount of its whole budget was set when I took part in the project. However, at that time, the number of staff there could be counted on one hand, with three core members: the director, Hayao Miyazaki, the animation director, Yoshiharu Sato, and the art director, Kazuo Oga. So, there was no desk and chair in the studio for the project. It was almost empty. I remember that I had lost hair every night during the project because I was under a lot of pressure and stress managing the completion of a feature film in only one year, including having to build the development team for the project from scratch. After the film project My Neighbor Totoro, I undertook the same job for Studio Ghibli’s next feature film Kiki’s Delivery Service (1989). A film production company named “Fuudo Sha” proposed the film project to Studio Ghibli which would’ve been directed by Sunao Katabuchi. After Hayao Miyazaki completed My Neighbor Totoro, he took a vacation and travelled abroad to recover and freshen himself up for work. He was back to the studio from that when Kiki’s Delivery Service was near the end of its pre-production stage, with the scenario and character design completed. Mr. Miyazaki said: “Oh, this is a very interesting project”. Hence, the film eventually ended up being directed by Hayao Miyazaki, and Sunao Katabuchi as the assistant director. Working for Kiki’s Delivery Service was so hard for me as a line producer, that I actually developed gastric ulcers again and again during the project.